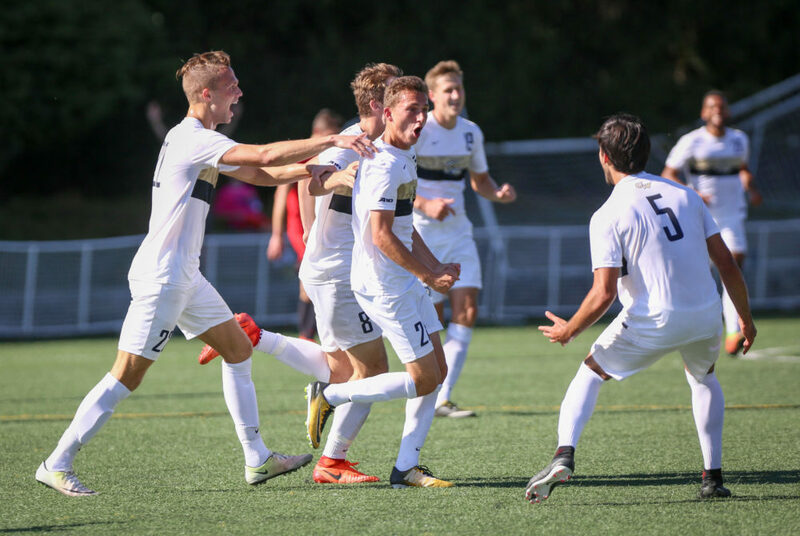 Men's soccer celebrates Saturday after a goal scored by sophomore midfielder Drini Redzepi. In the opening 82 minutes of play Saturday, men’s soccer and Dayton combined for only five shots on net. But for the Colonials, their two attempts translated into two goals and allowed the team to take command of the otherwise back-and-forth game. GW (5-5-2, 2-1-0 A-10) picked up its second straight home win in Atlantic 10 action and snapped Dayton’s (5-6-2, 2-1) two-game win streak by defeating the Flyers 2–0 at the Mount Vernon field. The victory was the Colonials’ first following a win after beating George Mason Wednesday. Höfs – who was wearing a pink jersey for breast cancer awareness – made three saves on the day, two of which seemed to be likely goals. In both the 28th and 35th minute, he met with a forward one-on-one inside the box and deflected their shot out of bounds with a reaction save. Saturday was Höfs’ second consecutive shutout and fourth of the year. The final score does not tell the full story of Dayton’s first-half offense. The Flyers had GW’s number during the majority of the first period and had several possessions that ended in the Colonials’ box. The game’s first goal came less than a minute before halftime when a combination between freshman midfielder Brady O’Connor and junior forward Dylan Lightbourn opened up a run for freshman midfielder Peirce Williams. After a couple of touches, Williams beat the goalkeeper with a shot from his strong-side left-foot. Less than nine minutes after halftime, the Colonials added their second and final goal. Off of a lofted ball in the box, sophomore midfielder Drini Redzepi took an overhead shot with his back to the net that slotted in the top left corner. The goals were first-career finishes for both Williams and Redzipi. Dayton was the first team in seven games to allow GW to score multiple goals. Finishing has been a challenge Jones has highlighted all season. At the start of the game, Dayton brought the ball into GW’s 18-yard box and pressured the Colonials defense. Turnovers allowed the Flyers to have the majority share of the possession including an early corner kick that was cleared out. In the seventh minute, a Dayton cross found a forward in the box for a volley shot. The attempt sailed well over the net, but set a tone for the early part of the game. After trading sides of the field for more than 10 minutes, GW found its first two opportunities off of free kicks from a distance – neither of which ended up on target. With six minutes left to play before the half, O’Connor made a long run down the line and played the ball to Redzepi, who one-timed the ball wide of the net. In the 58th minute, senior defender Christian Lawal stopped a Dayton forward with a sliding tackle in the box, preserving the two goal advantage. The Colonials did not slow down on either side of the field as the game progressed. Sophomore midfielder Colin Anderson got his head on the ball in the box, but missed his mark. Immediately following, Dayton launched a counterattack, but found few openings despite the pressure. Höfs was forced to make his first save of the second half with 20 minutes left on the game clock. Although the Flyers continued attacking and getting a fourth and final shot on net in the final minutes, each of their efforts was quickly met by GW’s defensive line. The Colonials return to action in Philadelphia Wednesday where they face off against La Salle (4-6-1, 0-2-0 A-10) at 7 p.m.